Long elf ears are a staple accessory to finish off a "Lord of the Rings" costume for Halloween or a Renaissance Fair. You can mold and shape a set of elf ears with clay, and then cover them with a layer of liquid latex to create the finished ears. Liquid latex is the product used by special effects professionals that will give the most authentic appearance to your elf ears. The project takes a few hours but is not difficult and requires very few supplies. The ears are sturdy and reusable for several events. Break off two pieces of polymer clay, each about 4 inches long and 2 inches wide. 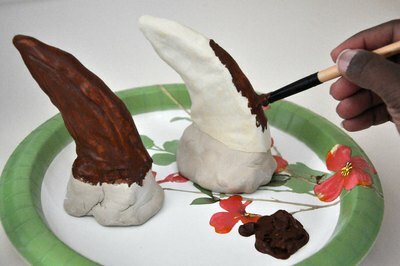 Mold the clay pieces into the shape of long and pointy elf ears. 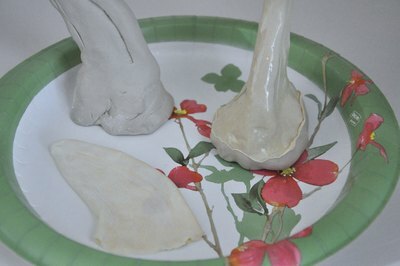 You will use the clay ears as a standing mold to paint the latex over the final ears. 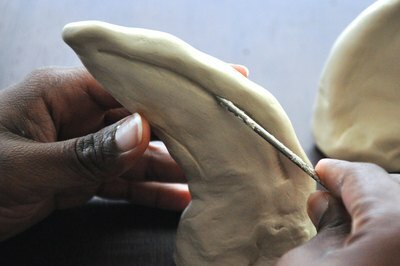 Create a flat bottom to place on a surface, and then mold the pointed top of each ear on the clay, making the ears in any length up to about 3 inches long. Maintain a thickness of about 1/2 inch. Carve details into the clay. The pointed areas of each ear should mimic the round, folded edge at the top of your ear. Use a clay carving tool to create a triangular-shaped indentation, starting about 1/4 inch from the outer edge of the clay ears. Place a paper plate onto your work surface, and stand the clay pieces on a flat surface with the pointed area of each ear facing up. Press them so they sit flat. 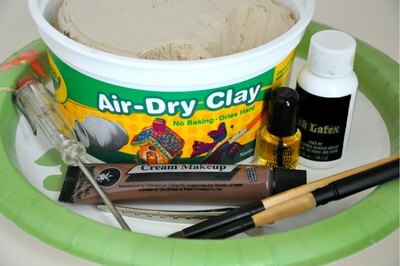 Allow the clay pieces to sit several hours or overnight until they are thoroughly dry. Brush a thin layer of liquid latex over the clay pieces. Brush over the tips and down to almost the bottom edge. The bottom edge is the area that will be flush with the top of your ear, so paint the line curved to match the curve of each ear. Let them dry according to the bottle directions. Paint another layer of latex on each piece, allow drying, and repeat the process to create at least 15 layers. Add a new layer every 30 minutes, or after each layer of latex dries. Allow the final layer to dry overnight. Remove the latex ears from the clay by carefully pulling them apart. Paint the latex ears with acrylic paint to match your skin color. Latex paints come in a variety of skin tone colors. Allow a drying time of about three hours. Pull your hair up and away from the ears with a hair clip, brush spirit gum around the inside edge of each latex ear opening, and place the elf ear over the top of each ear. 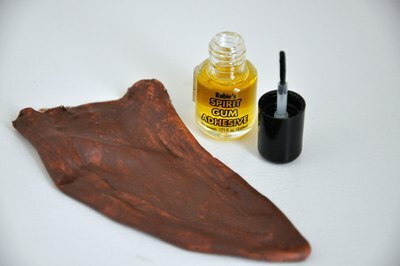 Spirit gum will adhere to your ears temporarily, will not harm your skin and is easily removed by applying rubbing alcohol with a cotton swab.